1. Casio BP 100, one of the first in the 1991 Year - also one of the first Japanese made BP (Blood Pressure) monitors, with Japanese writings for systolic/diastolic blood pressure on dial - this is one of my most favorite watches, from pure scientifically viewpoint! - I have already some of them from various periods of time (1991-1994) ! :)) - the bracelet is not genuine, but I have some more such watches in their original state, including bracelet, but only 2 from the early 1991 edition! The blood pressure monitor is cool to, do you have some pics of the Japanese symbols on the watch? Pic of the circuit by the previous owner. After the rinsing, brushing etc. Thank You both for Your kind replies. @Dutchsiberia: Excellent restoration project and exceptional skills! I cannot believe that such a damaged module has been restored and became functional. Btw, I will post some photos of the Japanese inscriptions on my early 1991 Casio BP 100 made for Japanese domestic market ASAP. @Kasper: Thank You for encouraging us all to contribute more to this high quality (indeed!) forum. 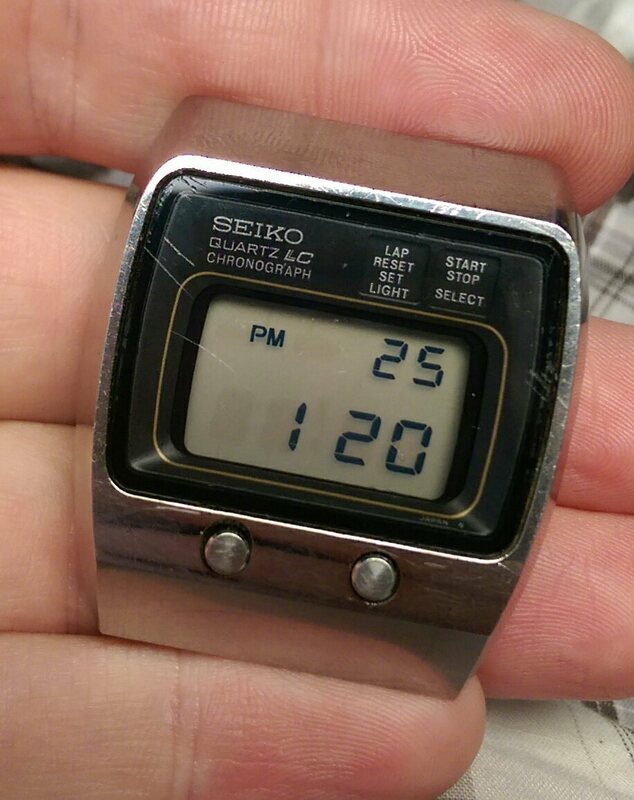 And now a photo of another rare Casio Calculator Watch: Casio CA 601G (module 481) ; G = the rare GOLDEN Case + golden bracelet version of the first 10 DIGIT calculator watch in history (1984) - Casio CA 601! very cool that it "advertises" it's 10 digits! What is the condition of the GP case? usually not very good with well used japanese watches. From the Doensen's book - WATCH. History of the modern wrist watch: "The Casio 'Touch Sensor' (Caliber TC-500) becomes the first watch in the world with transparent touch switches incorporated in the watch glass. If the watch is used as a calculator, the numbers and signs (+,-,x,:) on the watch-crystal are to be touched by finger. The results of the calculations appear on the same LC-display." Also, I have somewhere a (Casio?) catalogue image saved, where the same claim was made, this time from Casio: " the first watch in the world with transparent touch screen". But I have to find that file on may backup storage in order to present it here :(.